Have you seen the new and fancy sewing machines that come with a built-in laser beam? You can use the laser to line up what you're sewing before it gets to the needle. It's extremely helpful for quilting straight lines or sewing half-square triangles without drawing the lines. But what to do if you don't have a new and fancy sewing machine?? I have wanted to add an after-market laser to my vintage Bernina 930 Record for some time now. I had searched for one that might work, but never had any luck. Then I saw a tip from @downgrapevinelane on Instagram about one that was working for her! 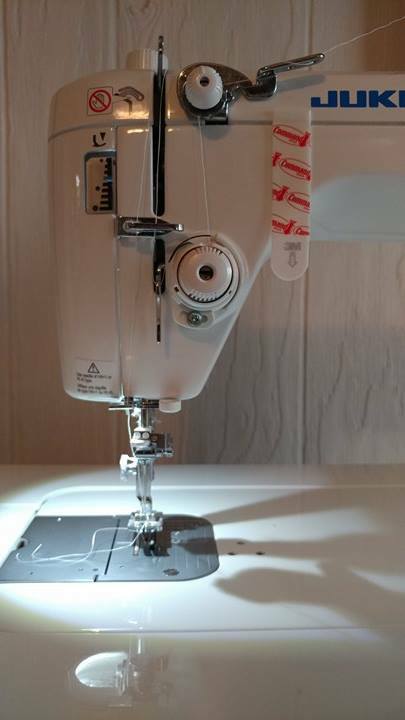 In the mean time, I switched to using my new-to-me Juki TL-2010Q sewing machine. It was the perfect time to do some experimenting! 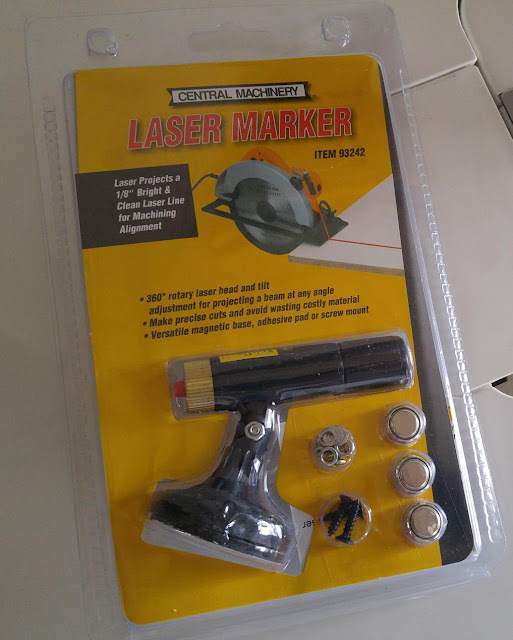 I ordered the laser on Amazon for around $15, but it is also available from Harbor Freight (for about half the price!). @downgrapevinelane purchased hers on Ebay. 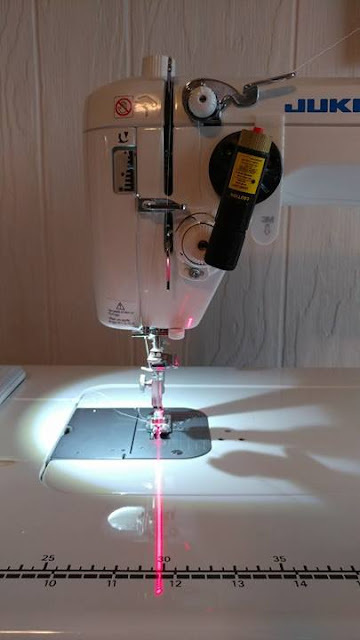 I positioned the laser to be out of the way of the thread and all moving parts of the sewing machine, being sure that the laser beam was still a straight line in front of the needle. Even at an angle, the laser beam is still straight and crisp. I also positioned the laser off the side of the Command strip in order to get the beam to line up properly since that place on my machine has a bit of an angle to it. It took a bit of trial and error, but I got it! Next up was a sewing test! For the project I was sewing, I needed to stitch a diagonal line from corner to corner. Usually, I would use a ruler and draw a line on the wrong side of every square. However, using the laser, I didn't have to draw any lines! 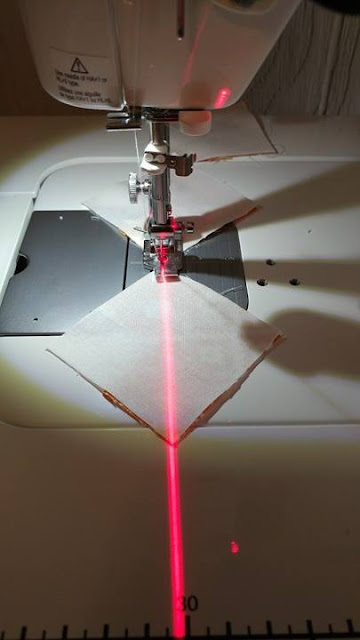 As the sewing machine feeds the fabric, be sure that the corner of the square stays in line with the laser beam the entire time. It's so much faster than drawing lines, and much more accurate than just eyeballing a straight line! The laser also works for sewing half-square triangles two at a time. 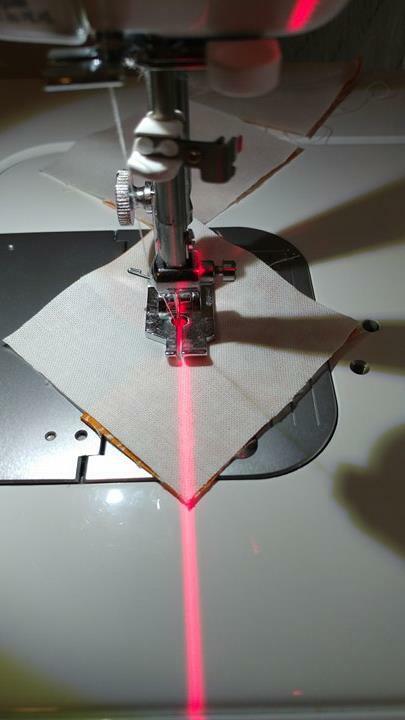 Just adjust the laser so the beam is 1/4" to the left or right of the needle. 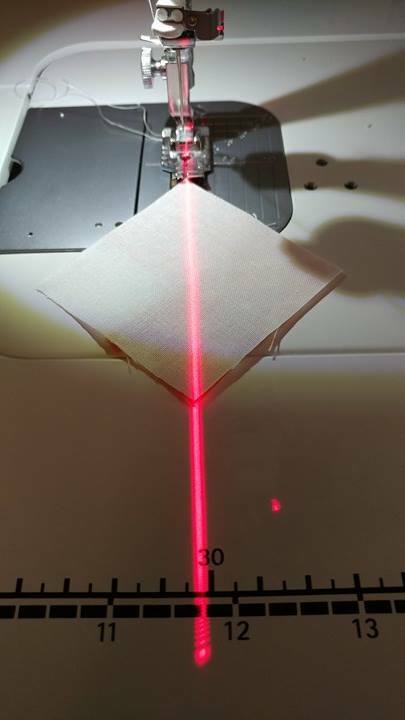 Then keep the corners of the square in line with the laser beam as the fabric feeds. Flip the square around and sew a second line the same way, then cut down the middle as usual. 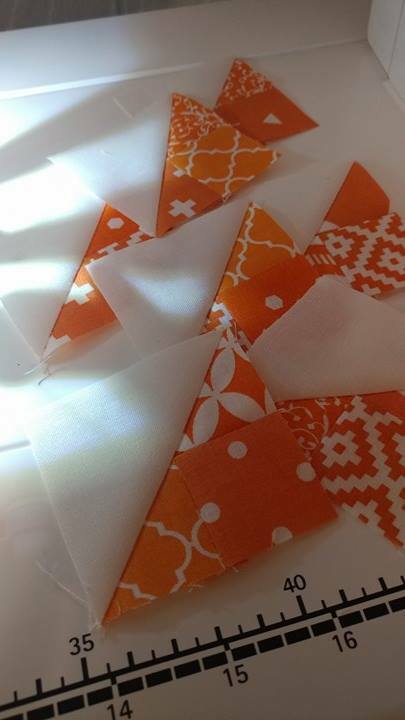 Perfect HSTs without the added step of drawing the lines! 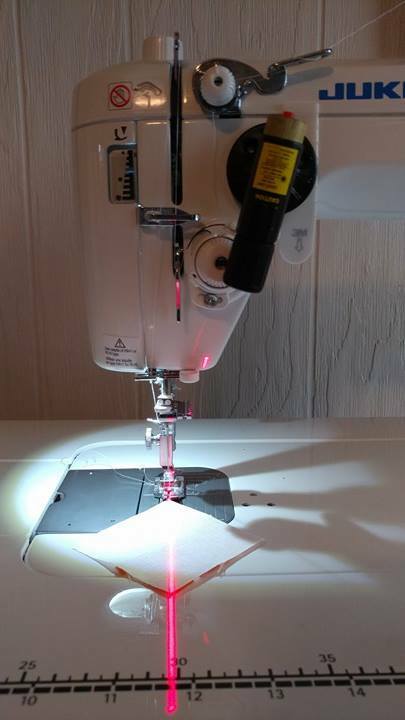 I am very excited for this new and fancy feature on my sewing machine! With two young boys in the house, every minute of sewing time is precious. I love finding ways to use those precious minutes more efficiently! 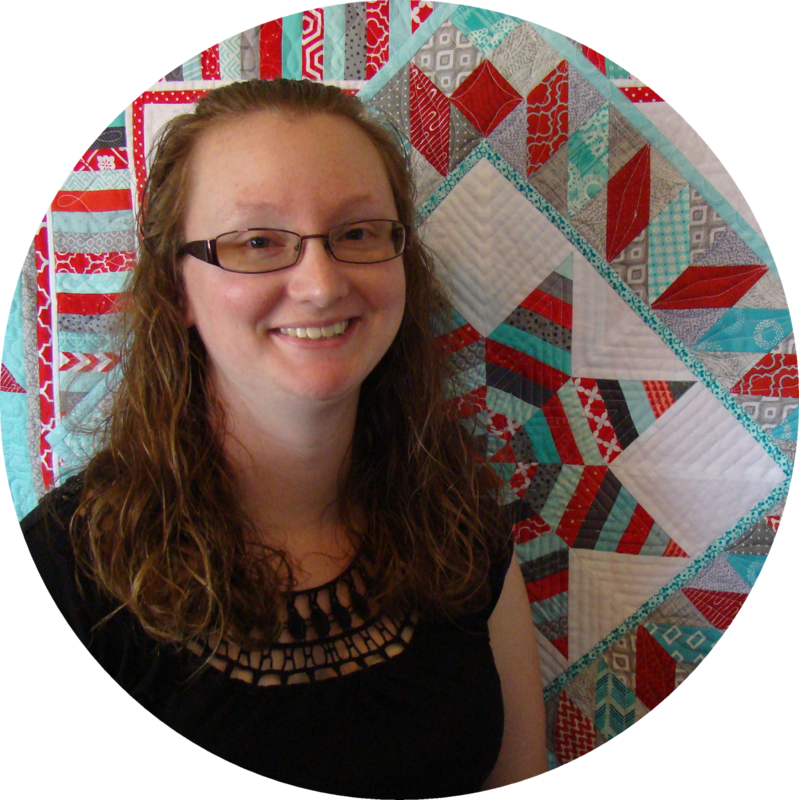 Linking up to Tips and Tutorials Tuesday at Late Night Quilter. Ooh, the fancy laser light! I only started noticing them lately, and I really want one, but of course, they only come on those fancy machines. Thanks for sharing such a great economical light! I may have to check it out. I need all the piecing help I can get! Love these. Gonna check this out and see if I can find one before my quilt weekend where I am doing a bunch of half sqaure triangles! Thank you so much! I love my machines but wanted this laser option, but not willing to trade in just for that....thank you Thank you!!!! Genius!! I too have a Juki 2010 and would love to save some time when piecing HST's. Thank you for the pics and info on where to purchase one! I think I see a visit to Harbor Freight in my near future!! Awesome, stopping by Harbor Freight on my way home tonight! Very cool idea. 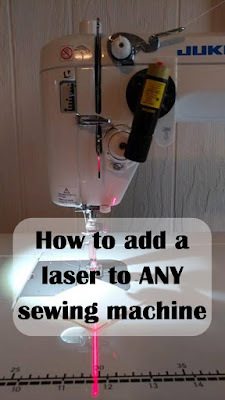 I've noticed more people talking about the laser on their sewing machine lately. That is amazing, Laura! No more drawing hundreds of lines on squares! 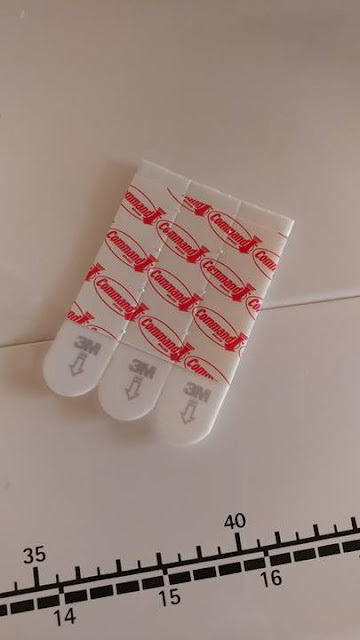 With the Command strips, it stays put very well! This is so cool! And how great would it be for straight line quilting too? Thanks for sharing! This is awesome! I've seen this as a tip, but haven't tried it myself. Thanks for the thorough review! Can you use the laser on the computerized machine? I was told you can't use anything magnetic around it. Absolutely! Just use the Command strip to attach it instead of the magnets! 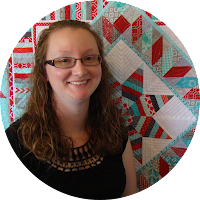 Afton teaching a class that involved making HSTs, and having a student school me about why she didn't need to draw guide lines since she had a very upscale machine with a laser, I began to wonder if I could add one. I hadn't found anything that would work...until now. I was able to find this laser for $5.99 at Harbor Freight, and added it to my machine without incident with the Velcro Command strips. I'm so excited about my machine "update", because, after all, everything is better with chocolate or a laser. 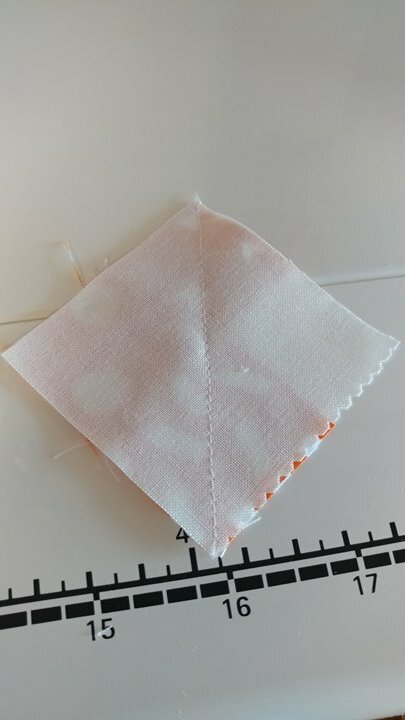 I struggle with accurate seam allowances when using my serger - do you think this would work on a serger? Love the idea, thank you for sharing! I'm always willing to try! As long as you mount the laser away from the thread and moving parts, you should be able to get it to work! Thanks for the posting and the problem solution. I had purchased one, but then could not attach it for the reasons you stated and was very disappointed. Now I will be able to use it! You have just changed my life!!! LOVE this! Running to Harbor Freight now! How and where do I get one of those laser lights for my Juki sewing machine. Please let me know. Just ordered mine through Harbor Freight and was able to use a 20% off coupon code (31232842). I believe the code is good through the end of the month. Thank you so much!! I had the idea to try this but, I couldn't find a laser that would stay on without having to hold down the button the entire time or a way to mount it. I am heading to Harbor Freight! My lovely new machine, Pfaff 3.0 bought from a closing down quilt shop for less than half price comes with amazing lighting. No further lighting needed, hoorah!!!! Has anyone used this to center machine embroidery designs? I bought one sometime ago but couldn't figure out how to make it work, thanks for the illustration and advice, I'm on it! Can't comprehend how the red line "turns" when it gets to the needle. Hang picture to keep them straight. Do I dare sneak into his " tool dungeon ?" Have you used it line up your fabric to get the scant 1/4" seam? I really like this ideas. I wonder how I could make work to find the center of the inside an embroidery hoop. Thanks for sharing. thank you thank you for trying this out and publishing the results! Brilliant! Happened upon your post on pinterest. I must say I can't wait to try it. I went to Harbor Freight today and it only cost me $90.00 oh, I took my husband...my mistake. The laser was $5.99 or something like that. Thanks for the info. I also am having trouble getting this lined up. Don't understand how you can get a straight line when the laser is at an angle. Brilliant information, right on time. Tried Freight Harbor today but had none. Lucky I found your post today. When I do get my hands on one, I will know just what to do!!! Thanks so, so much. Thank you for your article for the laser. I am, however, trying to figure out how the laser points downward and then bends to show a sewing line. What am I missing? The laser is a line laser, not a point laser. This type of laser projects a wedge of light like sunlight shining through a door that's ajar. It is not the same type of laser that just projects a dot of light. This laser is made specifically for projecting a line. What a fabulous idea! As a novice quilter this would be heaven sent! My husband's face (who is a lover of all things "tools") lit up at the mention of Harbor Freight. We will be making the trip today. Thank you for this! I have a Juki and I couldn't figure out how to attach the lazer. Now I know! How cool is this? I love it, I'll save so much time just looking for a marking pen, tracing paper, or anything that will work. Brilliant! My machine is not computerized, so I did not remove the magnets. If you need to remove them, I would suggest an awl. It appears they might be hot glued in, so using a hair dryer to heat them up a bit first might help. Good luck! Did you actually remove the magnets? Can’t get them out, what tool did you use? I'm having the same problem. How did you remove the magnets and what tool did you use? I have been using one for the last couple years and it works great. But, be sure your machine is on a very firm table or cabinet as it will move otherwise. I have never used it on a serger as you have the little lines on the feet that shows you were to serge. I can not get my laser to sit at the quarter inch mark without having to one side of the base sitting up about 1/2" no matter what I do. Any suggestions? Oh man! I have mine with the Command strip only on half of the base. Maybe you could use two Command strips on top of each other to raise that side even more? Is there any other spot on the front of your machine that would work? 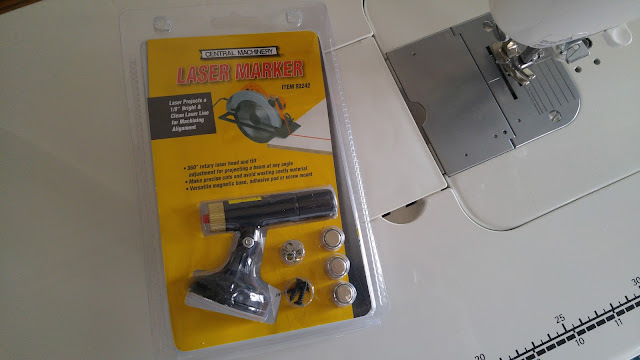 I ordered one from Harbor Freight which took 15 days to arrive via FEDEX, only to find there is a store locally...Anyway would not fit my Janome without obstructing thread path. So I put it on my Ott light with a long neck and hang it over the front of my machine and it is great. Thanks for the info. I used a Scotch brand sticker 1" which holds 1 lb, works well. Do you still like it? It has so many negative reviews about the light going on and off and the switch breaking, etc. Thank you. Thank you for your reply. I'm going to try this. It takes so long to mark with a pencil. This is a great tip. I ordered the light and velcro. Will try it on my Brother 950 model.